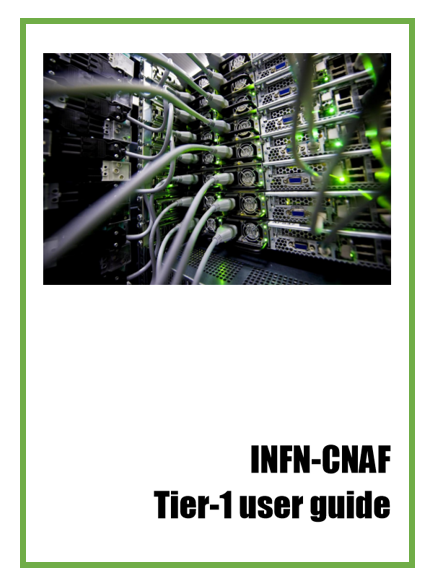 Here you can find a guide on how to use the resources at CNAF-INFN. Please read the INFN-CNAF Acceptable Use Policy and the INFN “norme per il trattamento dei dati personali” (Italian only). Send the access authorization form via email (sysop@cnaf.infn.it and user-support@lists.cnaf.infn.it). For non-INFN user, please send along a copy of your ID card or passport. After a check of the documents, your account will be created, and you will receive a confirmation email. Once on the web page, you will be asked to insert the Identity Provider in order to authenticate. If you are an INFN user, just type “INFN” and you will be able to select “INFN – National Institute for Nuclear Physics”. All the other users have to select the Identity Provider associated to their institute. Click on “Start single sign-on” and you will be redirected to INFN Identity check web page where you can enter your INFN AAI credentials. In order to obtain a TERENA pk12 certificate, you have to select Grid Premium in the drop-down menu named “Product”. By clicking on “Request Certificate” the certificate will be saved into your browser, from where you can download your certificate in .p12 format. You will also be able to download the certificate as a .zip file. For example in Firefox just go to Preferences -> Privacy & Security -> Certificates -> View Certificates, then double-click on your certificate and click on Details -> Export. If the bold part is not present or the timeleft there is zero, the proxy has not the voms extensions and has to be regenerated. The mechanism of proxy renewal is based on proxy delegation: a long-term proxy is stored in a dedicated server, so called MyProxy server (e.g. myproxy.cnaf.infn.it here at CNAF), and is used to create a new short-term proxy before the old one expires. Even if a proxy can be created with arbitrary lifetime, the delegation is necessary because its VOMS extensions have a limited lifetime, decided by the VO. In the jdl of the job, specify the hostname of the MyProxy server. A password is required and has to be manually inserted. Nota bene: each job has associated the proxy that was on the UI at the time of job submission. LSF9 (IBM Platform LSF Standard 9.1.3.0, Feb 1 2015) is used as batch system (manual, useful references) in our farm. Have a look at this page for a description of useful GFAL2 commands for data management. CDG minutes and slides are available in agenda. At CNAF, the meeting room is “Valerio Venturi”. Remote participation is possible, following the instructions sent via mail. Monthly reports presented at Tier1-CdG meetings are available in the agenda. To use CNAF VPN, one has to point to https://gate3.cnaf.infn.it and to follow the installation of the client. if you haven’t a CNAF certificate, then you must use an username and a password. The account must be requested with a mail to net @ cnaf.infn.it. When you update your personal certificate, in the Cisco AnyConnect client text field please insert gate3.cnaf.infn.it. You should then select the personal certificate that will be used by the client for future connections. The procedure to configure eduroam or INFN-dot1x is the same. You just need to select the desired network between the two. No matter your operating system, when doing the setup you need to provide username and password which are specific to eduroam or INFN-dot1x, and which you have to request your computing center for. The username is always in the form utente@sezione.infn.it. Please have a look at this page.